Dendrobiums can be so impressive when allowed to grow to a large size, this Dendrobium delicatum (or perhaps Dendrobium x Delicatum) raised by talented gifted grower David Fischer is just another one of the massive Australian species of dendrobium (which I love, ever since mastering the culture of D. speciosum). This is presumed to be a natural cross between D. tarberi and the common D. kingianum and one can see the resemblence. While the landscape and design installations at the Philadelphia Flower Show provided theater for the crowds of people coming to see bold bedding schemes and mass-effect displays of spring bulbs, where the show really delivered for me was in the category of horticulture - in particular, the amateur horticulture (which seems like a silly term when on thinks about the many excellent specimens grown by knowledgeable enthusiasts and horticulturists at this show), but this show has a history of attracting some of the finest growers in the North East and Mid Atlantic who bring their most choice orchids, alpine and cacti to name a few, to display and to win ribbons and awards. 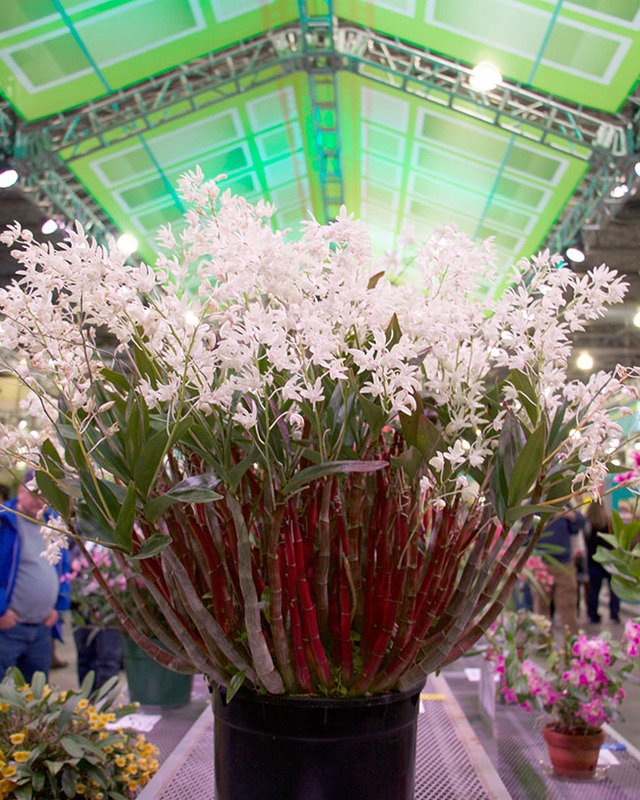 As if a designer went crazy, this almost unbelievable plant is an orchid - Oberonia setigera raised and entered by Christopher Satch, of the Rutgers Alumni Growers & Exhibitors. Good flower shows are ideal places for seeing rare or unusual plants, and I can't help myself when I see a plant that is new to me. 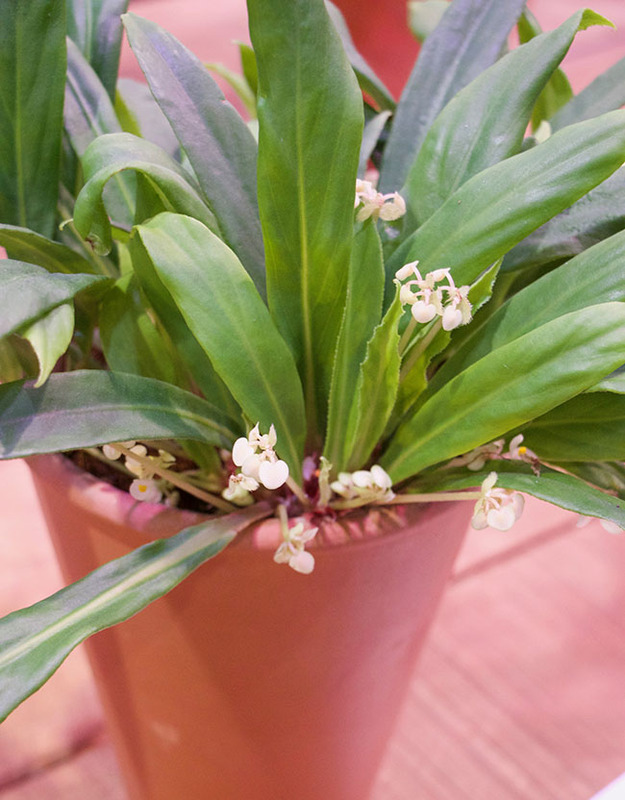 A few years ago while visiting the Tokyo Dome to see the World Orchid Congress exhibition, I left with a short list of orchids that I had to track down ( and, I few I did such as the massive Dendrobium speciosum which is in bud in my greenhouse right now - and could grow as large as my greenhouse! ), but the Dendrobium x delicatum (seen above) is now tops on my must-get list. 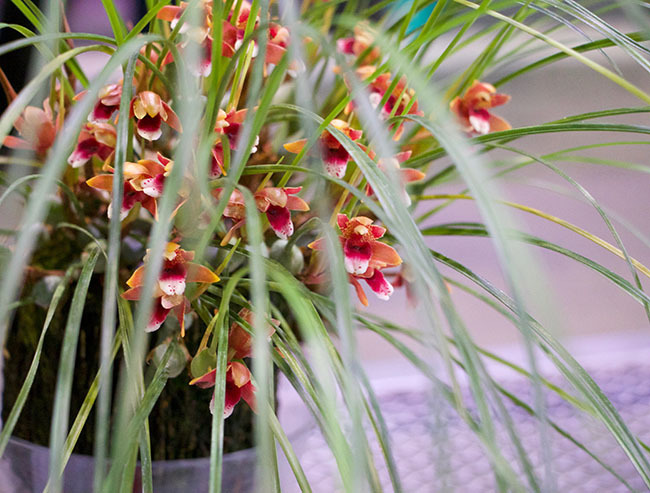 It's always a danger adding to ones must-get list when visiting a good flower show! So, beginning with orchids here, I began building said wish list - because the horticulture at the Philadelphia Flower Show is so fine. Cattlianthe 'Trick or Treat' 'Ty's Rutgers Triumph' CCE/AOS shows how crazy some orchid names can be as modern intergeneric crosses are names with variety names and awards.To simplify or translate this name a bit, Cattlianthe is a name known as a nothogenus( an inter-generic hybrid made from two distinct genus, in this case the genus Cattleya and the genus Guarianthe). 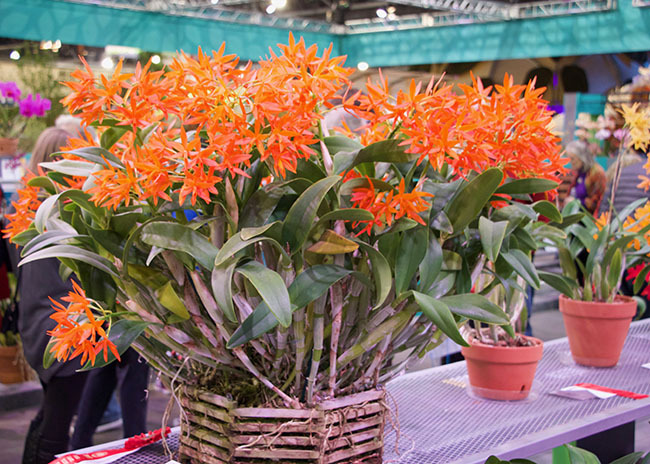 Sometime, way back in this orchids history, the two genus were crossed to create Cattlianthe. 'OK, orchid 'Trick or Treat' may be a better name! Barbara Inglessis a member of the South Jersey Orchid Society entered this beautifully specimen of Maxillaria sanguinea. 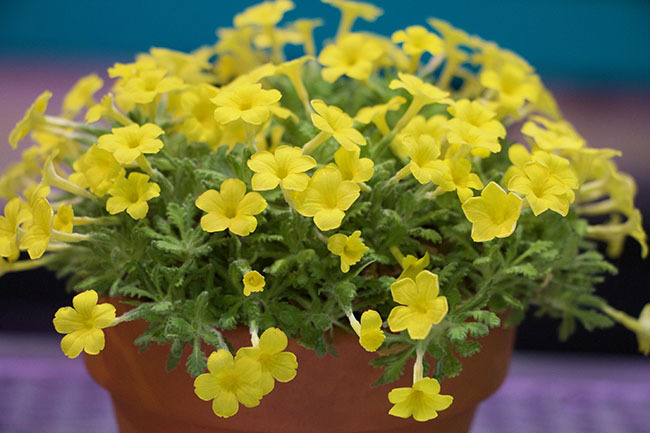 A rare and challenging to grow and force alpine, Dionysia aretioides captured plant geeks' hearts. Each raised and entered by John F. Ray, a member of the North American Rock Garden Society. 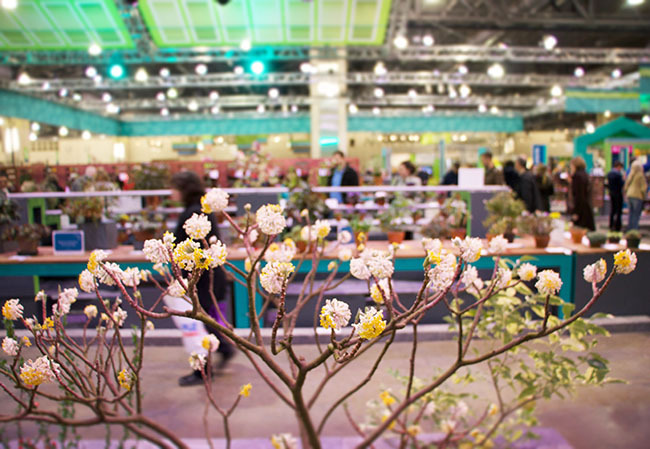 I had heard about some of the alpine displays at the Philadelphia Flower Show, but I never expected to see what lay before me here - dionxysia's ( not the extremely challenging ones seen in the great UK shows, but any dionysia in North America is worthy enough to make headlines in any horticultural journal, surely something most show attendees here probably missed, but these little pots and troughs in the alpine classes impressed me greatly. 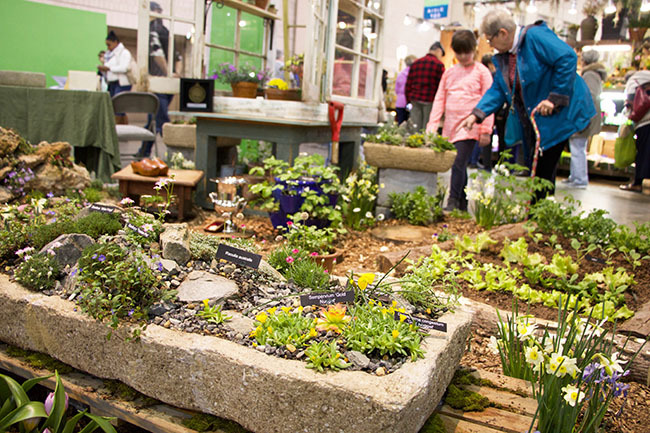 There are some very talented alpine growers in the Philadelphia area! I was thrilled to see that the local chapter of the North American Rock Garden Society (NARGS) not only had a beautiful display garden, but also one which one many top awards including the Gold Medal of the Massachusetts Horticultural Society as well as the prestigious Gold Medal of the Philadelphia Horticultural Society. The NARGS garden was designed and built by the Delaware Valley Chapter of NARGS, their inspiration and theme was DUTCH ALLOTMENT GARDEN, and it included some lovely troughs, a small vegetable plot, flowering bulbs and a tiny homemade greenhouse often found in small European allotments. It was very popular with show visitors. 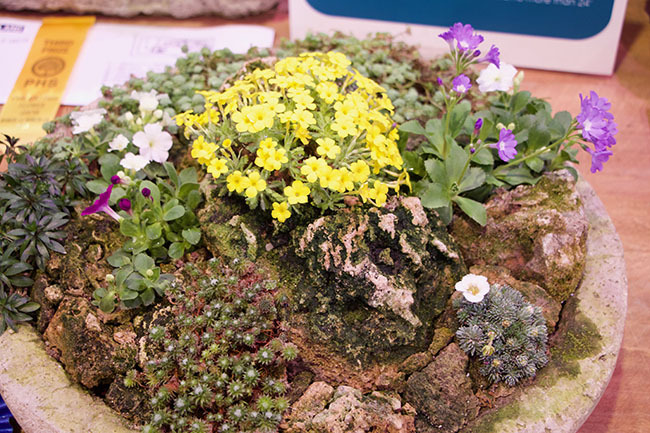 The alpine plants in the NARGS Delaware Valley Chapter was superbly grown unusual and challenging species. 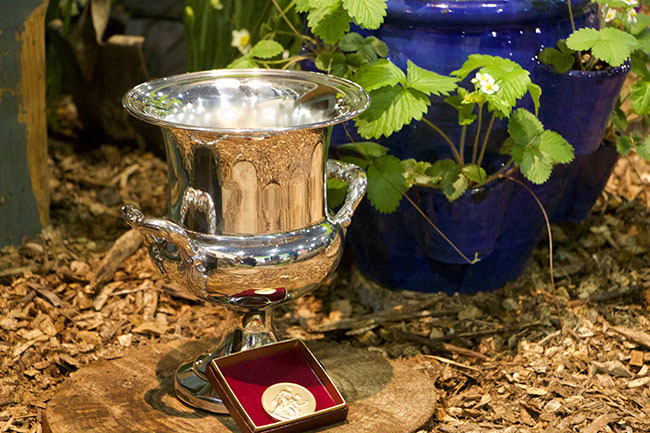 Congratulation to everyone from the NARGS Delaware Valley Chapter for their huge and prestigious win at this premiere flower show! 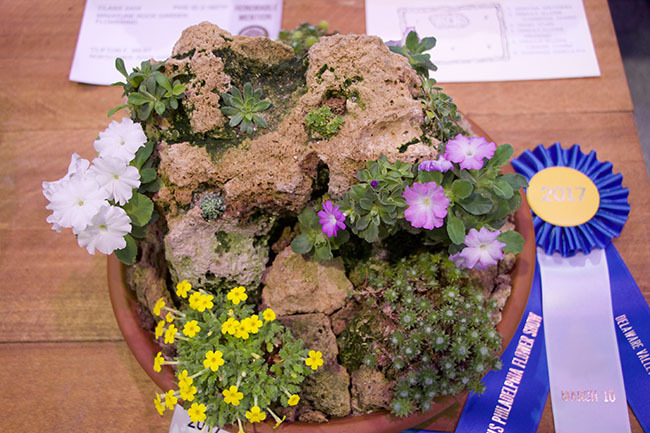 I am guessing that some of the growers of these alpine troughs with alpine plants in the amateur category were also members of the Delaware Valley NARGS chapter - I mean, how great are these? Troughs entered by both Clifton Webb and John F. Ray took top ribbons. This trough by John F. Ray took a few top ribbons, but most impressive were the number of entries in this category. Rock gardening is experiencing a reprise, I think. 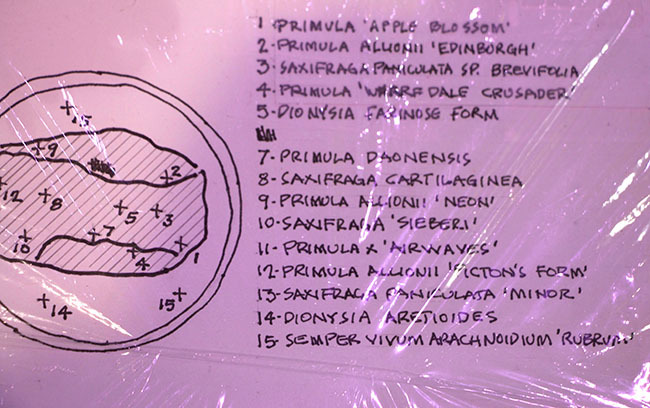 Mr. Ray labeled each plant ( a requirement) but a map helps the viewer! Another well planted trough with authentic and well grown alpine plants entered by John F. Ray. 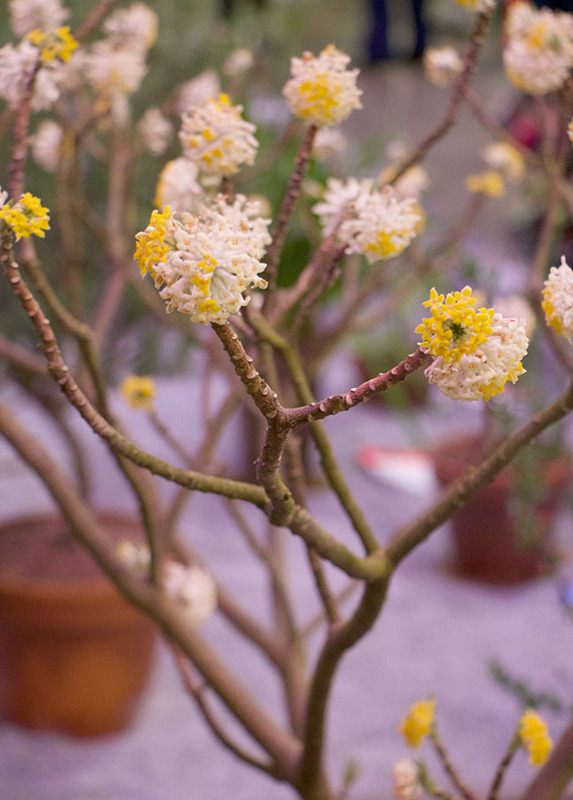 The striking blossoms of Edgeworthia chrysantha on a well-branched specimen. For some reason, I can never smell the scent on these yet everyone else can. Noses can be like that sometimes! Edgeworthia chrysantha may be fine shrub for warmer zones, but it also is growable in containers in colder, northern gardens. My plant is just beginning to bloom in the greenhouse, yet spends the summer outdoors. Exhibitors' collections of Hoya selections and varieties show how one should grow Hoya on ring forms, and demonstrates what a nice collection could look like. I visited Logee's greenhouses this week, but resisted. I resisted. I did. This inspired me to amp-up my scented geranium training skills! Come on - really? A bit of France in a pot, right? This pelargonium caught my attention, a rather new cultivar of the lemon scented geranium but one with very dense foliage. 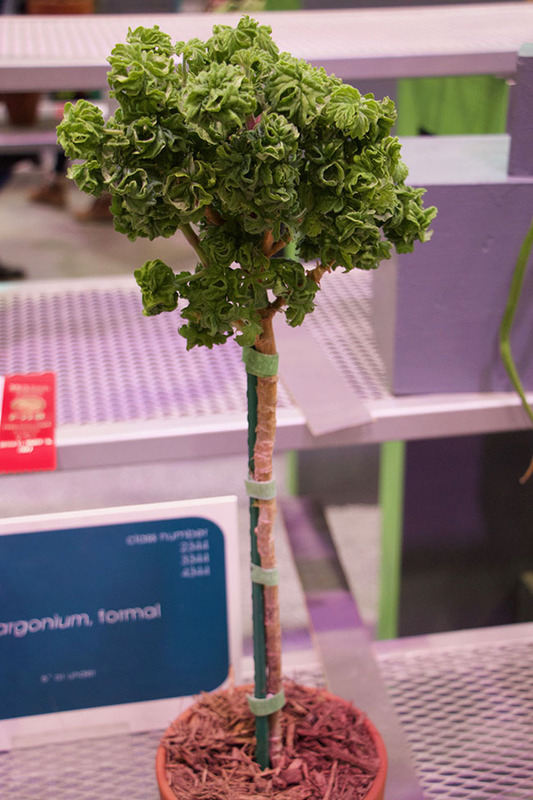 Entered by grower Leslie Anne Miller, the variety is a patented one often sold under the cultivar name 'Bontrosai 'or 'Lemon Sculpture' according to her label (everything at this show is properly labeled). I haven't seen this in the trade yet, but it seems to be available in the UK (it was registered in Poland). 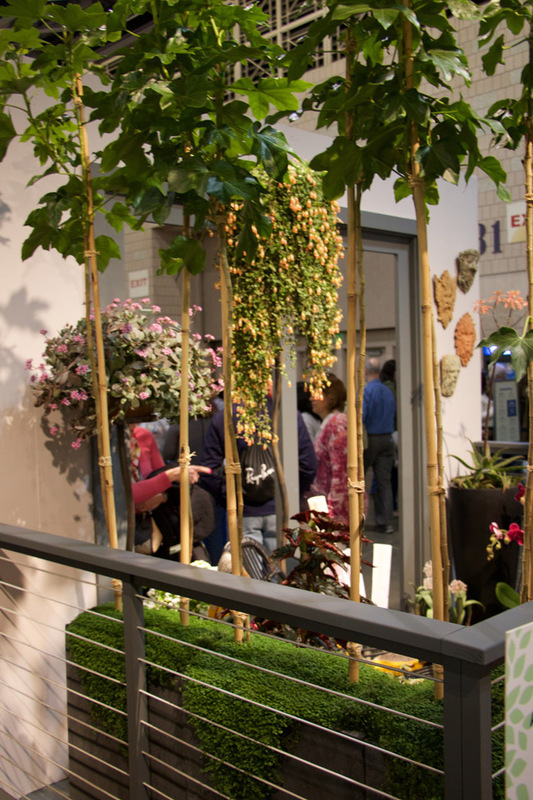 The star of the show for many horticulturists and designers was this planting scheme by the landscape design firm TOOP, founded by Carrie Preston a New Jersey native who moved to the Netherlands. Sometime innovative design and innovative use of horticulture combines in a magical and wonderful way. Sure, this years' show offered plenty of wow - from Sam Lemheney's fantastically designed entryway with a floating flower field illuminated with LED lights and floating above more than 30,000 fresh tulips, to windmills, wooden shows and most ever Dutch bike found in North America, but the real star might have been this garden designed by Carrie Preston (a New Jersey native designer who decided to open her own landscape design firm in the Netherlands after spending some time there on an internship while in college. Carrie's firm STUDIO TOOP (along with a troop of local volunteers -mostly local area plants people) created an installation entitled 'Stinze'. 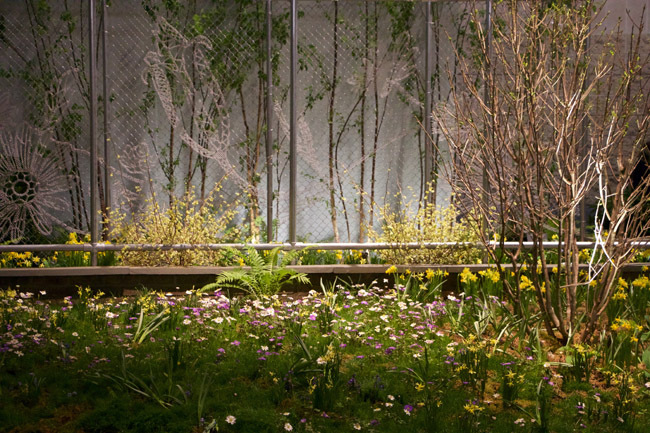 A breathtaking treat which shocked some attendees with its bold understatement which included a wild-inspired planting in an urban setting complete with chainlink fencing and what looked to many like a lawn or abandoned garden with a lawn which never saw a drop of Roundup. This either delighted the plantsmen, or horrified the golf enthusiast. Carrie Preston's 'Stinze' demonstrated how a more natural inspired landscape can be both beautiful and sustainable with grasses, ground covers, self-propagating bulbs like snowdrops, narcissus, crocuses and anemone blanda. I would imagine that finding non-sterile forms might be more helpful (as ironically, most Dutch wholesaler bulb growers sell sterile, non-seeding varieties). Later, I read that 'stinze' is a term that the Dutch use for bulbs that self-propagate over many years (kind of like our ephemerals or woodland wild flowers.). A very smart way to establish community-like plantings, similar to what other Dutch designers are creating with perennials which is changing the way many of us design gardens. Inspired by nature, these more 'natural' plantings may look 'weedy' to those used to the neat and tidy weed-free lawns. ], but these sustainable plantings are changing how many of us garden. The color and size of these two plants stuck me - the red oxalis and the big tuberous sinningia with silvery leaves. Who needs green with colors like this? 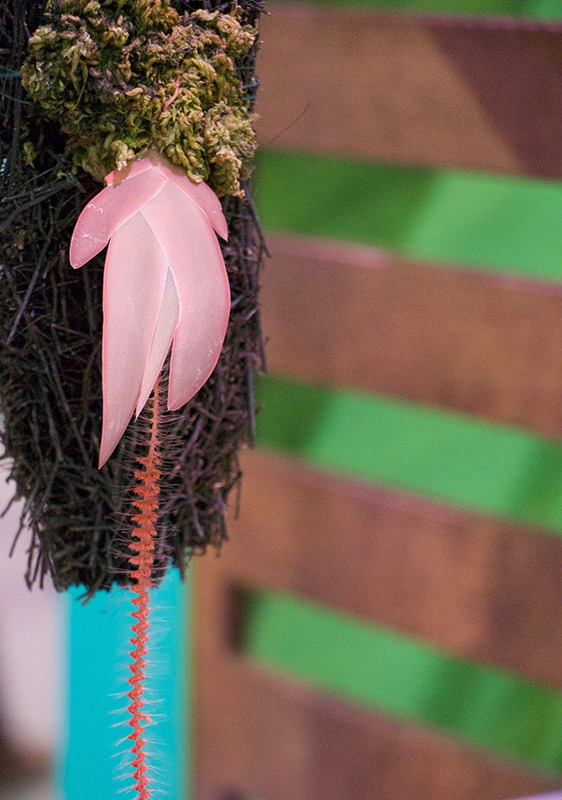 Maybe it's time to raise the bar on your houseplant selection. Speaking of houseplants, here was a new one for me - Begonia lanceolate, an lovely specimen raised and entered by Janet Welsh of the Huntingdon Valley Garden Club. 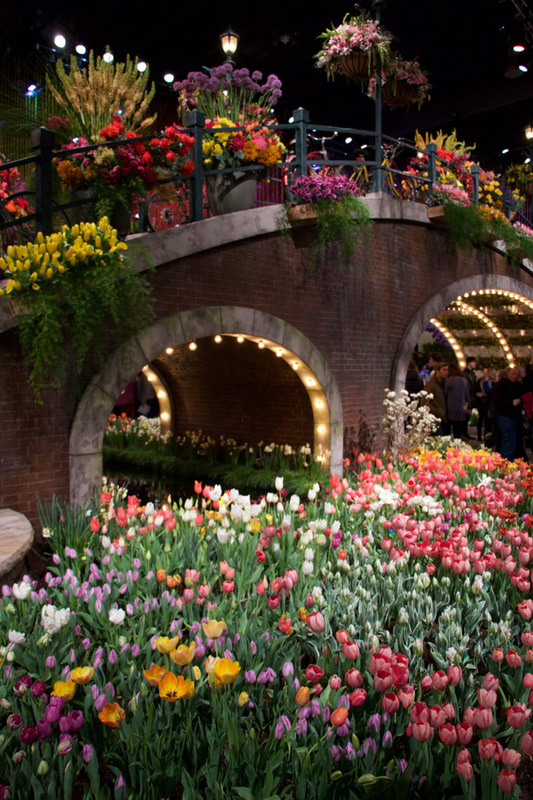 A carpet of tulips set along a canal bridge bedecked with even more flowers welcomes attendees at the 2017 Philadelphia Flower Show - a theme this year that celebrates Dutch culture. Although I am no stranger to spring flower shows, it's been nearly a decade since I've taken the time to attend a major one. 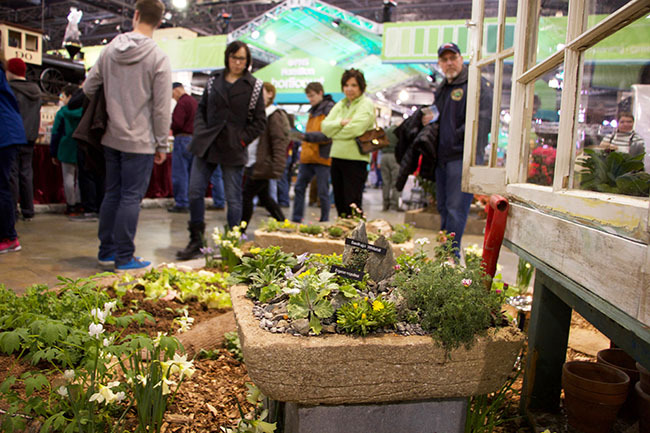 That said, the great Philadelphia Flower Show is one I have never attended so I was looking forward to being wowed, yet half expecting disappointment. It's safe to admit that I experienced a little of both, but don't get me wrong - any disappointment comes from being over-exposed to the flower show circuit and from being a bit of a plant geek - the 'wow' here certainly delivered a punch, even to me, the most jaded of plant folk. 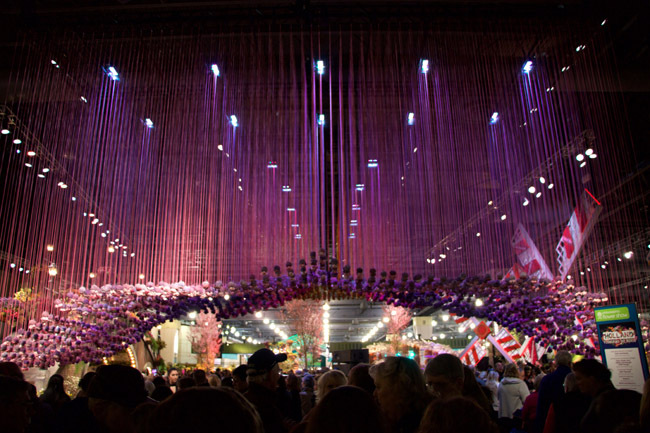 The these this year was Holland, and if you know anything about flowers, you know that the Netherlands is home to the world's largest flower market, and central hub of most every plant and cut flower sold on this planet, so one would expect a virtual explosion of flowers with this theme, which is exactly what the organizers got. This years' show was Disney meets The Netherlands meets a museum installation. 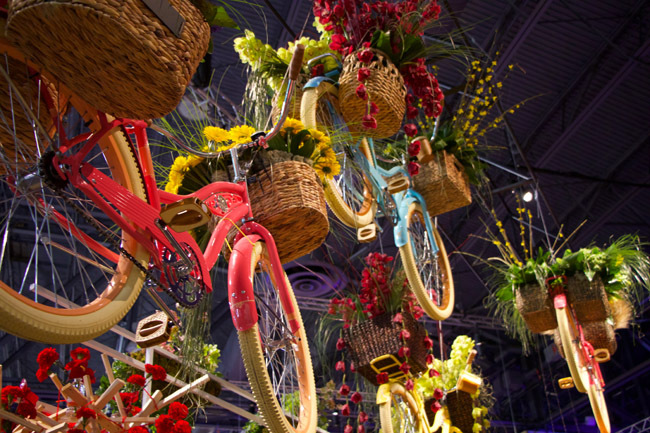 Even if you don't like flowers (I saw a few husbands holding their wives handbags and flowers near the ladies room checking out the bicycles suspended from the ceiling), no one could get bored with this level of display. 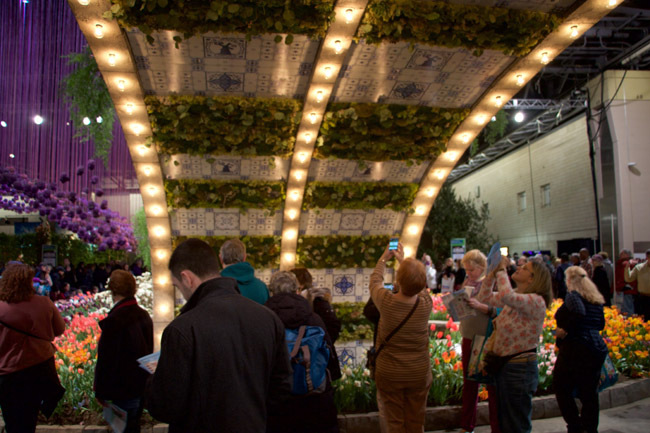 No detail was overlooked by the talented show designers, even underneath the bridge elaborate Dutch tile work and floral design delighted most every smart phone user. 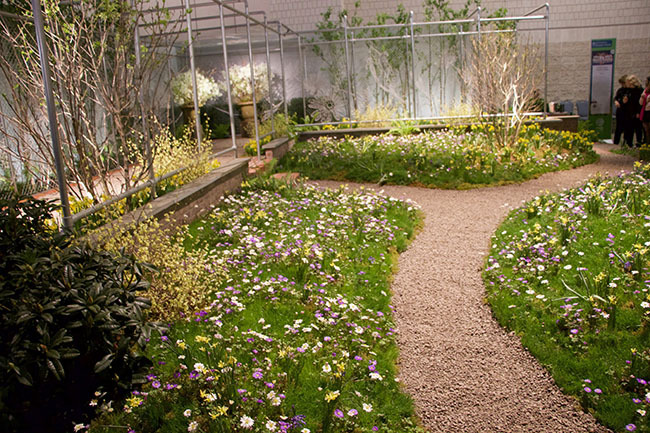 As I mentioned earlier, I am no stranger to this phenom called 'the spring flower show'. I attended my first as a little kid, and have fond memories of riding high on my dad's shoulders in the mid 1960's looking over a sea of tulips at our local spring show then sponsored by the Worcester County Horticultural Society at Horticultural Hall. Later, I remember the excitement and anticipation attending shows int he winter at around age 10 or so. 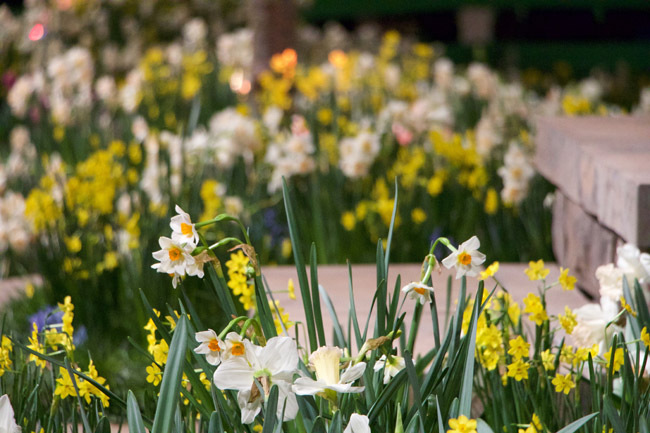 Seeing glimpses of forced branches in the windows of Horticultural Hall as snowflakes fell, was a particular memory, as is the scent of daffodils and hyacinths indoors. 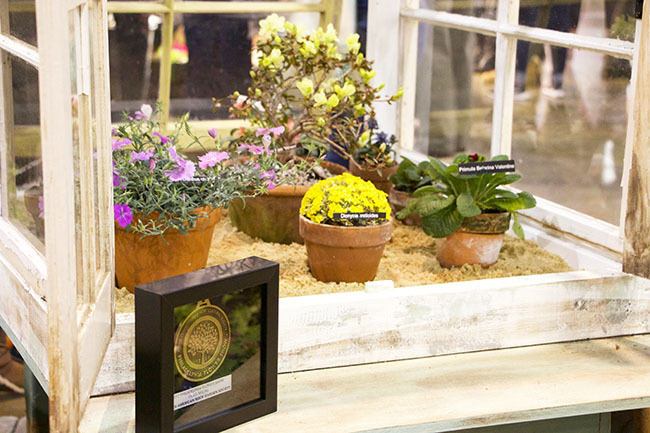 IN fact, attending spring flower shows was probably the most influential event when I think about what got me first so excited about plants. So, hopefully, that still happens with young people who attend these shows. Design is often best appreciated in the details. 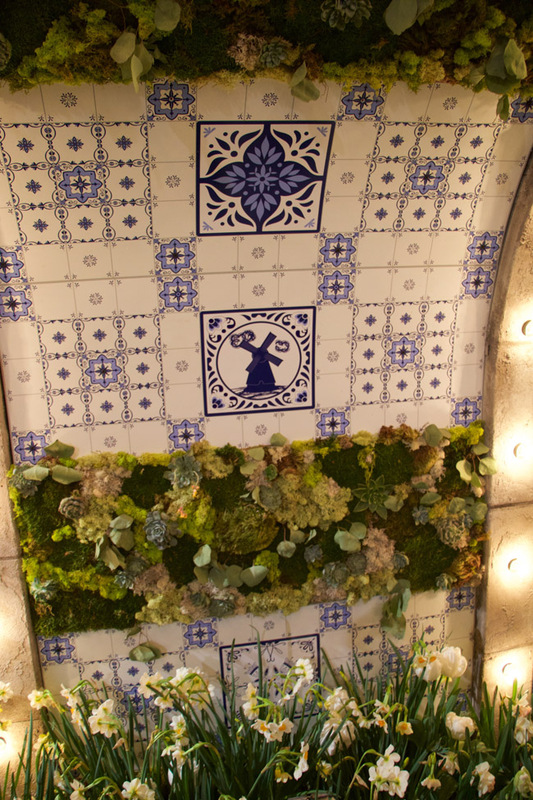 Under this reproduction of a canal bridge, which could have so easily been left unfinished, was a thoughtful installation of delft pottery tiles and a collage of plant material. As guest passed under the bridge, it became a favorite selfie spot. The adult me views things with that burden which experience brings - a filter of unintentional yet innate cynicism earned through either over-exposure or just desensitization. Yet even though it's sometimes hard to reach the same level of excitement over forced tulips (I can fake it, but sometimes that is just sad), this show still excited me because design was of such a high quality. Some might say that there were too many bicycles and windmills, that the Dutch wooded shoe-thing was too cliche, but I am a sucker for cliche - at least when it's designed and presented so well. 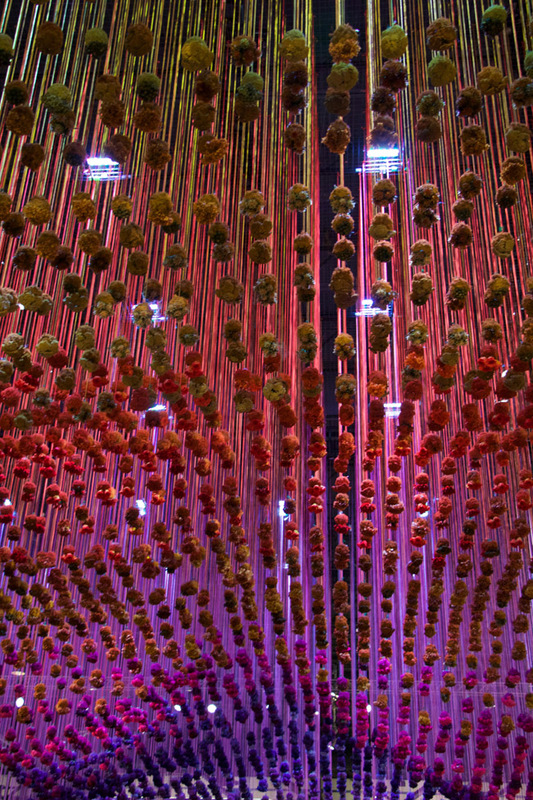 When visitors emerge from under the canal bridge, they enter this space with colorful suspended dried flowers, all illuminated with color-change lights that wowed everyone, regardless of their age or interest in flowers. It's all about the experience, right? 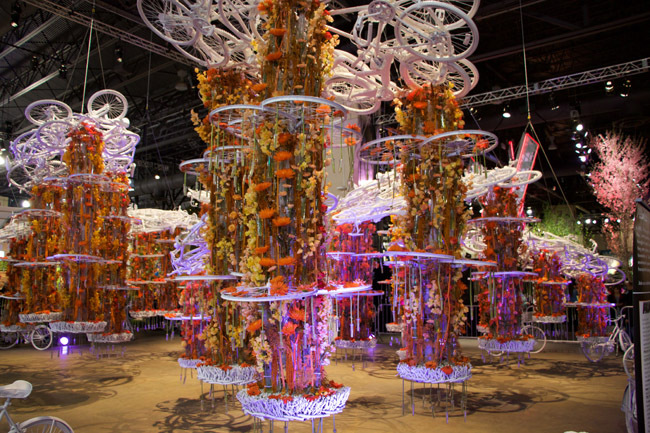 Attending this show is like visiting Amsterdam as well as the flower fields of the Netherlands, but also it delivers a contemporary punch with installations and techno music - not unlike an evening in a hip museum opening or even a Dutch nightclub. I do think that something from the 'Red Light' district might have rounded things out, but no one here dared go there. Clearly, this was a family event, but I think one of the design themes for floral design might have been interesting with a more 'provocative' theme. 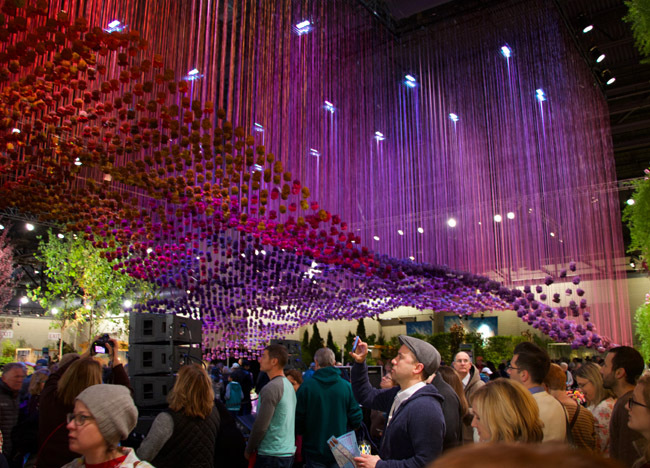 Another view of the color installation of dried plant material and color/illumination. 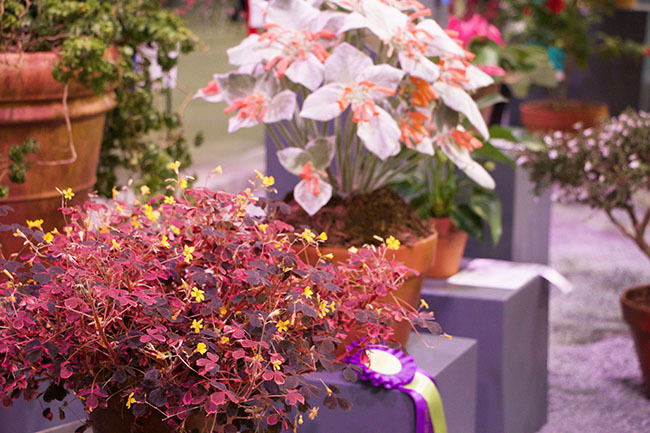 This years' theme for the show is 'Holland: Flowering the World', perhaps the most delightful of flower show themes to ever work with for designers, not only because of the euro-centric possibilities, but because of Hollands strong connection to the world of ornamental horticulture. Clearly, the designers here went wild with the theme, but don't worry, there are enough windmills, bikes and wooden shoes for everyone. I never thought about it, but if you think about it - the Dutch windmills were perhaps the first sustainable source of energy creation -how time cycles around, could have been an equally effective theme. Another installation inspired by the White Bike Revolution or White Bicycle Plan in the 1960's - a radical revolution important in the contemporary narrative of Amsterdam. You can learn more about it here. Or here.http://dangerousminds.net/comments/the_white_bicycle_revolution All I know, is that this installation was beautiful with it's white painted bikes and flowers. The bike motif was everywhere, but treated in clever and unique ways. I appreciated the mix of contemporary art and installation along with the classic and old. If you've ever visited Amsterdam you can appreciate the old, but the rest of the Netherlands is so contemporary, the show here crafted a nice mix of the two. 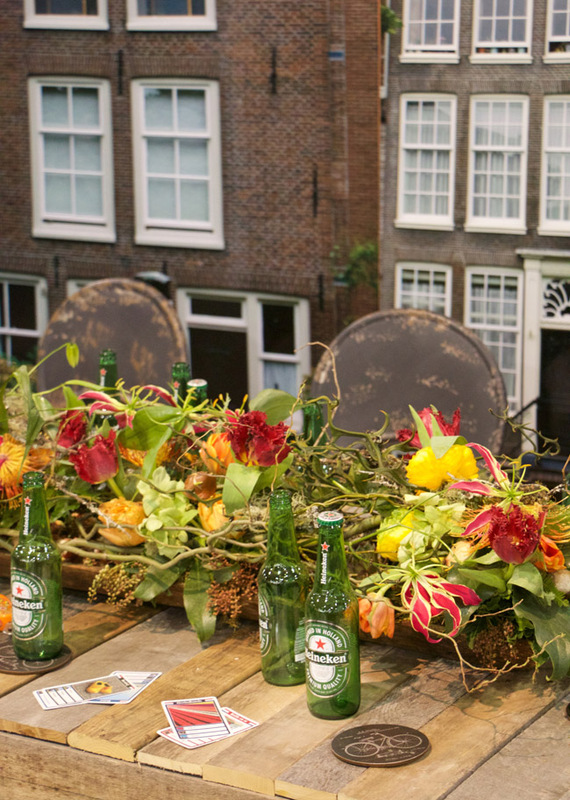 I liked these Heineken bottles along with a photo backdrop of Amsterdam, and not just because it's my fav beer - (I do like my skunk beer in green bottles! ), but the floral design and wood work was nice as well. 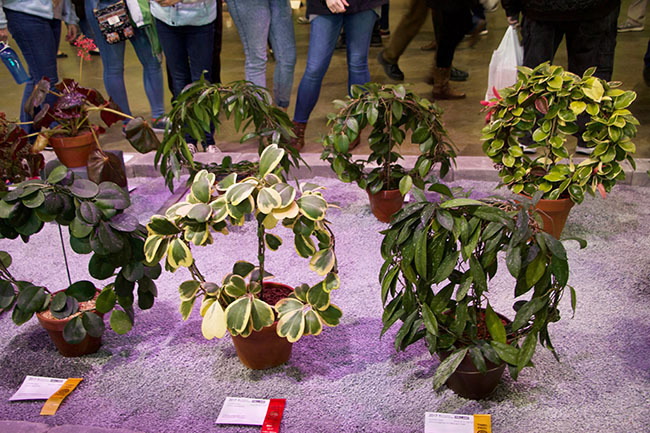 The Pennsylvania Horticulture Society puts on this show, which is the nations longest running horticultural event. It runs until March 19th at the Philadelphia Convention Center. 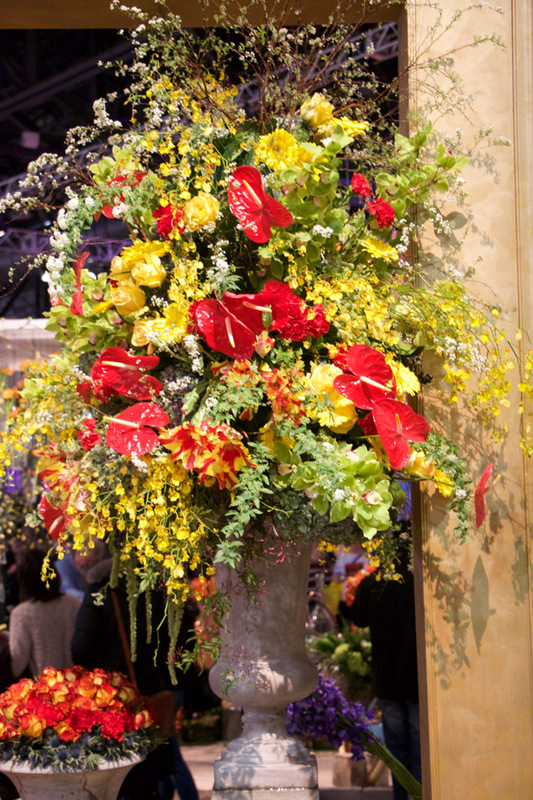 As in any flower show, there were modern arrangements, and classic ones. And then, some were just there to impress. I appreciated the mass plantings. 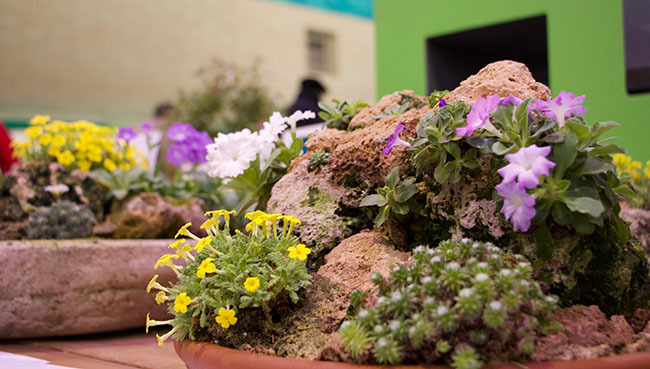 In the 1970's and 1980 when I would help install spring displays in high school and college, gradually greenhouse raised sod as a ground cover was replaced with Michigan Peat, because it was dark and brown. Eventually, the wood chip and shredded & dreaded bark mulch became omnipresent. Here, not even a whiff of bark mulch - in any display! Just massed bulbs because that's what we want to see in March when it is snowing. Abundant and ridiculously dense plantings of bulbs because -- we can do it when it's fake and someone else is paying for it! Garden designer Carrie Preston's. a New Jersey born designer who moved to the Netherlands 18 years ago created a display entitled 'Stinz '. 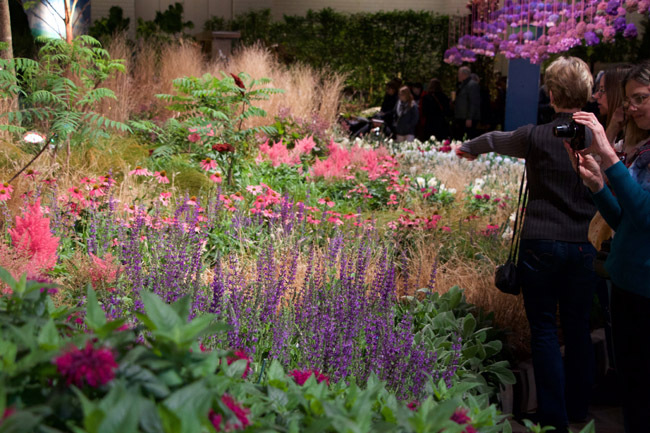 It stole the show for many of us with its natural planting scheme. Other leading Dutch designers were featured in the show as well including Bart Hoes, Nico Wissing, and Bart Bresser. 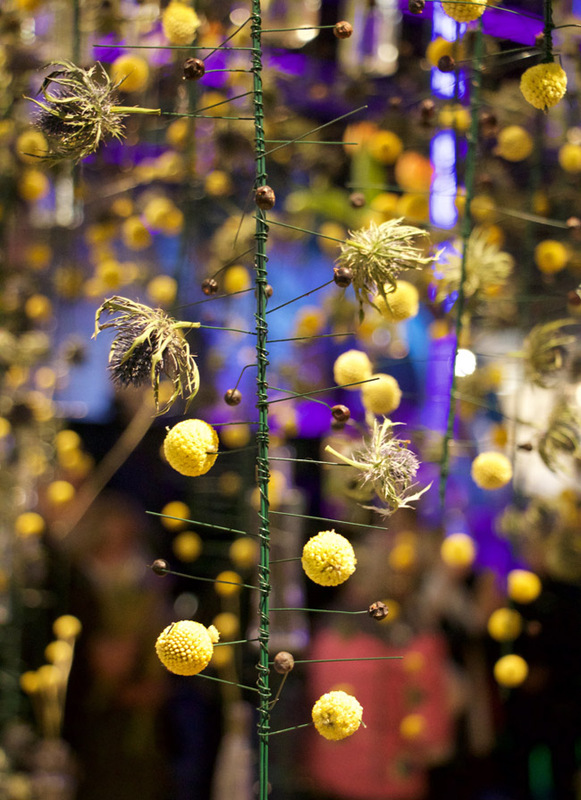 The inspiration this show provides to attendees is broad, with modern concepts presented such as Carrie Preston's 'Stinze' a naturalized planting which she explained as being inspired by the gardens that surround the more stately manor houses in the northern part of the Netherlands. Her design was a contemporary interpretation of these gardens, but I feel that most people just loved the natural style and look which some may have interpreted as 'wild'. To the uninformed, this design felt realistic if not meadow-like. I knew from social media images that the entire project was only completed the night before, but even then, it was hard to imagine that every plant was just a day or two ago, in a plastic liner or pot. The magic of spring flower shows in capable hands, indeed! The 'Stinze' display looked as if it was planted years ago by mother nature. So natural in fact that it was hard to believe that it was completed the evening before. I loved these Fatshedra standards - an idea that I may steal for myself! I thought that this design using bicycle parts as a bridge railing was an innovative way to recycle, or 'up-cycle'? (sorry!). In this spring show, don't expect the ordinary (nor bark mulch, forsythias or anything 'easy to force'. 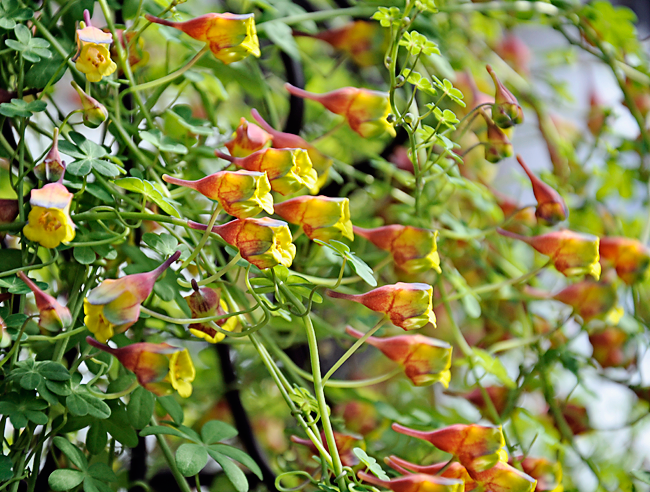 Instead expect unusual plantings that look natural, perennials and biennials that look as if they were plucked from a June garden, and leave with ideas, inspiration and some hope that spring isn't that far away. 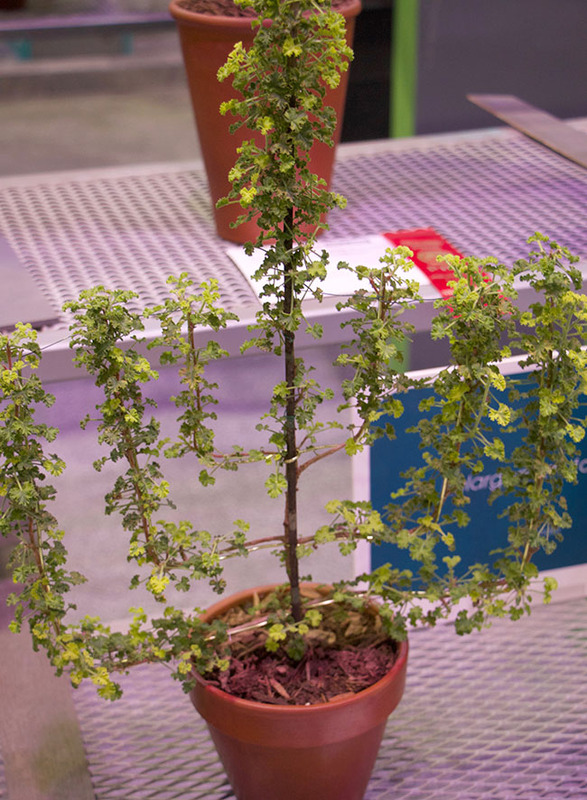 In the next post I will share some images from the 'Horticulture' section of the show. 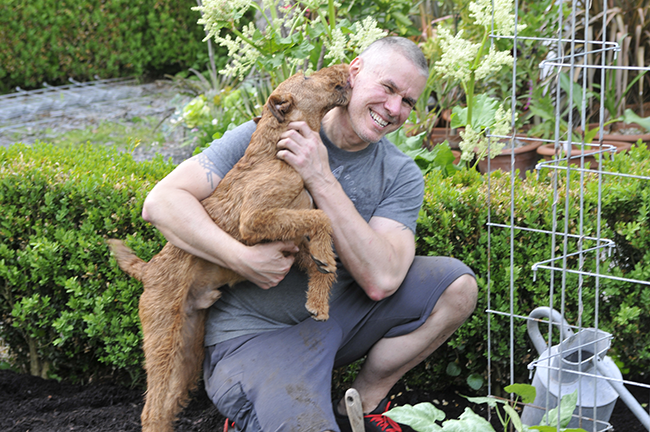 A photo from last summer, but with an entire summer off coming up due to leaving my job, I can't wait to spend time with the garden, and the dogs. After 27 years of working at one job, a bit of time to engage with the garden is just what I need. Last Friday My position at Hasbro was 'eliminated'. I'm good, thank you. Call it what you will - 'laid off', 'let go', 'position terminated', the truth is we all sort of knew that this was inevitable. When I began working in 1988 it seemed like a fine design job - but maybe one where I would stay 1 or 2 years. Flash forward nearly 28 years, and here I am. A great ride. Exciting, always challenging, and really - I wouldn't have stayed so long if it wasn't interesting and stimulating. I know that my position and career confused many people. "why is this guy writing a gardening blog when he also worked in the corporate world?" The confusion came both ways as well. It wasn't exactly an advantage, and my identity was muddled because of it. At work, my colleagues thought it was novel as well -- I often would say something like "oh, and I keep bees and raise show dogs," Until someone blurted out "did he tell you that he grows sweet peas and was in Martha Stewart last month!". Now, I can be a 'one-trick-pony'. Tuberous nasturtiums bloom in the greenhouse in March - now I can watch them open, day-to-day in the warm, spring sunshine - rather than checking on them for an hour or so, every weekend. I have some time now to think about next steps. A year or so off to regroup, to address all of the cliche terms like "this is a new chapter" or "this is the first day of the rest of your life.". I'm OK, and fortunate to have some savings and a cushion to land on - at least for a while. 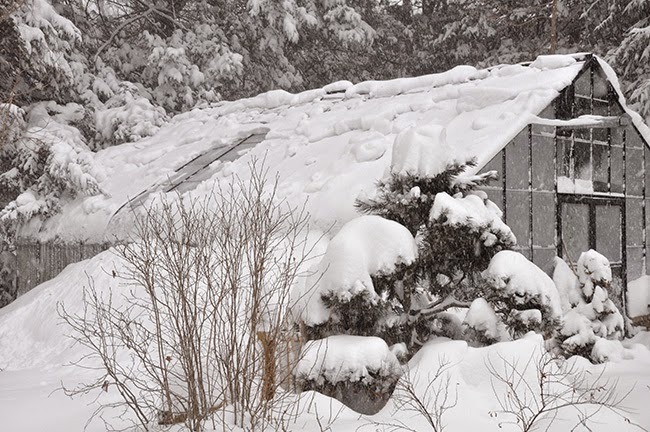 I do wake up in the middle of the night worrying if I might lose the house next year, or not be able to pay the heat on the greenhouse, but I will cross those bridges when I get there. I have so many ideas, and so many things that I want to do now, that I kind-of feel confident that something will take off. This is my transition week then. I need to buy a new laptop at the Apple Store this weekend, and then set up a new blogging studio - new software, new Adobe Photoshop and a new photo storage system. So bear with me as I upgrade digitally. By late next week, I should be a better and more efficient blogging machine - I am so excited. Go on - say it--- My garden here? It's is going to look soooooooo incredible this year! Those of us who keep corporate positions know that this is always an inevitable reality. In some ways, I found similarities with fellow garden blogger Margaret Roach and her career path. Not that I was a big VP at a publishing company, but close. As a principal at Hasbro, I had great demands of both time and talent. I never minded that, but I wouldn't be honest if I didn't admit that there were times when I wished that I could have been working on something personal. The day-to-day excitement can be invigorating for a creative but also a little exhausting. Mostly, it was the time demands that got to me. I always felt stretched and pressured, finding it challenging to fit both my lives into one, single life. If you read Margaret's book about transitioning from a big, corporate job to life in the country, then you know exactly of what I am referring to here, and in the end, it was this escape that I sometimes dreamed about at night. I was looking for Margaret's book all weekend ( I think I lost it). I wanted to re-read her chapters about transitioning, as part of me doesn't quite know what to do with myself (don;t worry - I'll figure it out!). My copy of 'And I Shall Have Some Peace There" must have been loaned to a friend, so I'll order a new one. I build my greenhouse after boarding a flight on 9'11 to Boston made me realize that some things are more important than a job and making money. So-- here is the strange thing - I noticed a peculiar fact while searching for Margaret's book in my book cases - there are many garden writers who began their garden writing career during this life-transition stages. I suppose it makes sense. Wayne Winterrowd and both of the Beekman Boys come to mind. The end of a job often means the opening of a new career. Getting laid off may be the best thing that ever happened to me, who knows. For now? I am setting up new computers - and guess what? 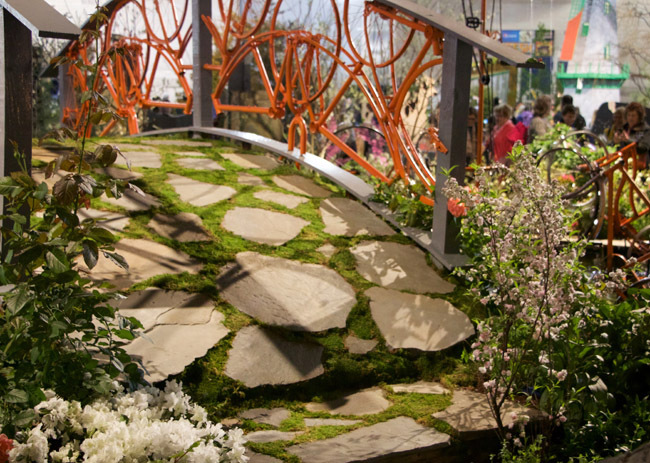 I am heading off to the Philadelphia Flower Show Friday and Saturday - a show which I could never make time to attend. Join me as I grow with plants, this next year. Who knows what will be next?